All the sons of Johann Sebastian Bach were skilled keyboard players. At that time this meant that they were also able to play the organ. However, only Wilhelm Friedemann made a name for himself as a virtuosic organist. Johann Christian was organist in Milan for some time; Johann Christoph Friedrich once applied for a position as organist, but never took it up. Carl Philipp Emanuel never held an organist post. It is presumed that at the court of Frederick the Great he accompanied his employer at the harpsichord. In 1768 he was inaugurated as Director Musices in Hamburg. It was his duty to compose for the liturgy in the five main churches, but not to play the organ. As a result his output for the organ is rather small. The main part of his organ oeuvre comprises the sonatas he composed when he worked at Frederick's court in Berlin. They were written for Princess Amalia of Prussia, Frederick's sister. The fact that she was unable to play the pedals explains that these sonatas are for manuals only. This allows performances on other keyboard instruments, in particular the harpsichord. It is notable that the organist Johann Carl Friedrich Rellstab (1759-1813) published Bach's sonatas in 1791 and omitted the first. The reason could be that it is the sonata which is most idiomatic for the harpsichord. This could well be the reason that Luca Scandali didn't include it in this 'complete' recording. Unfortunately he doesn't mention the issue. Rellstab also included the Sonata in d minor (Wq 69) which has the addition a due tastature; this sonata is also not included here. However, Scandali included six fugues which are catalogued as 119 in the Wotquenne catalogue; the first is omitted, and again the reasons are not given. Scandali also doesn't give the rationale for considering these pieces organ works; they are ranked among the 'keyboard works' in the work-list in New Grove. They date from 1755, about the same time the sonatas were composed. At that time the fugue had become more or less old-fashioned, and they are more about expression than about a technically 'correct' use of the form. The sonatas are not fundamentally different from Bach's sonatas for stringed keyboard instruments, although they probably have more prominent galant features than most of those. The changes in mood which are partly exposed through contrasts in dynamics, are realised here through alternation between the two manuals. Scandali makes the most of the opportunities his instrument has to offer and the contrasts within the fast movements come off very well. The slow movements include far fewer dynamic contrasts; here it is expression takes centre-stage. Scandali has chosen the appropriate stops to make this audible. That is also the case in most of the fast movements. Only in the fast movements of the Sonata in D do I find the registration a little too aggressive. It is plausible to assume that the organ which Princess Amalia owned was a rather modest instrument and therefore a more 'intimate' sound seems most appropriate. A specially enjoyable feature of Scandali's performances is his application of ornamentation - more than I have heard in other interpretations. The recording includes other pieces, some of which are considered of doubtful authenticity. Scandali should have mentioned this in his liner-notes, or argue why he thinks that they are from Emanuel's pen. In the cases of the pieces based on chorales it is hard to see what could have been his reasons to write them. The harmonic language is typical of the generation of the Bach sons, and the chorale melodies are different - both melodically and rhythmically - from what we know from the previous era. Scandali plays an Italian organ built in 2007; the pitch is a'=440 Hz, the tuning a modified Kirnberger temperament. The organ includes a Zymbelstern which Scandali uses at the close of the Prelude in D. I wonder whether this is anachronistic; it was often used in the 17th century, but was probably out of fashion in Emanuel's time. This 'complete' recording includes more pieces than previous 'complete' recordings, although it is regrettable that the first sonata is omitted. 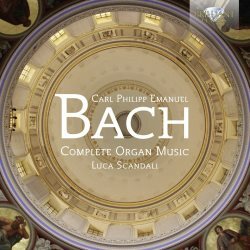 The organ works by Carl Philipp Emanuel Bach are not as well known as they deserve to be. For that reason this release is very welcome, and Scandali's convincing interpretations make it an even more attractive proposition.